The verbiage on this page is essentially the same as it was in 2004 when this site was introduced to the internet. Toward the bottom we have added content linking to pages that demonstrate the factual nature of our pragmatic approach to our trades. The exterior cladding industry has lost its soul to the "UNDERLAYMENT CRAZE" and the damage is showing itself in the discovery of MOLD and Rot. The video linked above serves as a warning to the industry and consumers. The onset of the ice & water underlayment usage in the northeast after the great ice storms of the early 90’s has brought with it a mentality that has made for the profession, a strange enigma. The experience that is forever embedded on the minds of those that dwelled under the massive influx of water resulting from ice dams has caused the mandate of Ice and Water underlayment usage in the installation of new roofing systems. This is much like a doctor that treats the symptom, rather than offering a cure. Ventilation is almost always the way to cure such problems. The costliness of doing the job right often involves a redesign of the situation. Many times, with a little education, more can be done with the proper approach that can afford a lasting roofing system and a healthier environment for those living inside the dwelling. The enigma comes in with the transient nature of the industry and the employment of techniques that are improper. Roofing flashings are usually laborious to replace properly and almost always neglected. 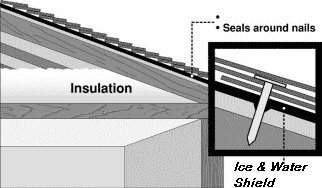 Ice and Water underlayment is also being used on low sloped applications, where shingles should not be specified. With a strong underlayment, an actual flashing leak can be disguised for several years. The leak, while unnoticed by the building owner, is poised to present a major problem down the road. The mentality that ice & water underlayment is the cure-all is just wrong. The only time the underlayment should be wet is in the event of catastrophic weather conditions. Read below for the Siding applications that are taking place in today's marketplace that are fully expected to leak. Many of the more seasoned craftsmen of the trade have an axe to grind about Ice and Water underlayment. The driving force behind the obvious angst felt by these artisans, most certainly, must have its roots in the new age of inexperience mentality that raises Ice and Water underlayment to the stature of a roofing system, in and of itself. As mentioned above, there are roofers that use a “Band-Aide” approach to roofing with the underlayments. When installing roofing, after the underlayment has been put into place, the thought of the underlayment ever catching water should never enter the roofer’s mind. In the contemporary mind set, sadly it does, and the material is being used as a primary waterproofing membrane in some installations. This is the peeve of the guys that pick up the pieces each day of shoddy workmanship! In the old days, these thoughts would never enter the mind of a roofer. His roof was the primary waterproofing membrane, plain and simple. A leak was a leak and no underlayment would ever be used in place of good roofing craft details. A better example of the compromised values of the industry cannot be found: Variations of these sticky bituminous products are being used behind Siding. 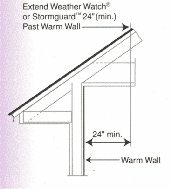 Vinyl Siding, in particular, is known to allow moisture to enter behind it. These membranes and several variations thereof are openly advocated by the industry ‘experts’ to be used as primary waterproofing agents. Terms such as "Flashing" are liberally being given to these membranes. Never have underlayments been so formidable. House-wraps and siding underlayments are being touted as the answer to leaking siding. These new underlayment products are permeable for moisture migration, but with the creation of a new dew point, perm rates mean little. Old craftsmen have always viewed underlayments as temporary. Now, they are widely viewed as part of a "system." A group of manufacturers have now given the designation of “Supplemental Rain Screen,” to their products. 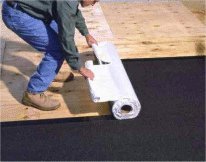 A Siding product being viewed as supplemental to the underlayment, by default, makes the underlayment the primary rain screen or primary waterproofing agent. In the use of 'J' channeling on siding, leaks have been created because of the materials used. Materials that expand and contract at enormous rates should be carefully considered before being installed on your home. Solid and stable materials are best. Those that do not move around, melt, and cause leaks are best, as they can be directly sealed at trim junctures. When the materials are stable and tight and strong, you can consider your home protected by primary protection and a true water shedding system can be constructed. True watershed methodology is not new, as it has been employed for centuries. To do a job properly, you must use proper methodology. The "wrap-up" mentality has been brought on by the deficiencies of some of today's cladding systems. Many homes have hollow walls or deficient vapor barriers on the inside of the buildings. 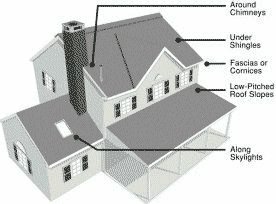 In the Northeastern climate, trapping moisture by the "wrapping" of a home without a care for the interior wall condition is a bad approach. A newly created dew point within the wall on a cold winter's day may begin a process that causes condensation, mildew and rot. These underlayments are of the highest quality; however, their use has been heavily criticized by the traditionalists of the trade. These are the roofers of the old world school of Slate, Tile and Copper. The reason for this aversion to this new product line is that its use under the aforementioned types of roofing would change the dynamics of methodology that has proven valid for centuries. Read: "Why Slate Roofs Don't Need Ice And Water underlayment Membrane." There are the contractors that are actually advocating the use of Ice and Water underlayment under low sloped Seamed and Soldered Copper Roofing Systems. Some install the Ice and Water underlayment, then a layer of Rosin Paper before installing the Copper. Copper Roofing needs only a Rosin Slip Sheet under it, but it needs to be isolated from acidic underlayments. If the roofer wants to install an asphalt paper under the metal to give another barrier for migrating moisture before a potentially cold copper underside, this makes good sense. It is the temperature exchange that causes warm, moisture laden air to drop its moisture. Better insulation, better ventilation, and a plastic vapor barrier installed on the warm side of the wall, or ceiling just under the wall board or plaster is the best scenario. The roof should not be overdone with underlayment like Ice and Water underlayment, because the summer heat will bake the substrate, if more heat retention is designed in the system. Copper roofing should extend up onto a steep slope, a good twelve inches, or more, for proper coverage. No direct nailing should be used in the installation, either. Only blind clips that are seamed into the system that allow the copper to move with ease over the slip sheet, should be employed. Small pans should be used, so as to not make for enormous expansion and contraction issues. Underlayments meant to be weather barriers do become vapor barriers under certain conditions and they do sometimes cause mold inside walls and roof assemblies. 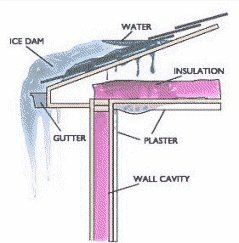 Diagram of an Ice Dam. Ice and Water underlayment being installed. These are the recommended areas to use Ice and Water underlayment. 24" min. inside pt. above warm side of wall.